UNITED NATIONS, March 19 -- While the UN Administration refuses to provide answers about its delay of ambulance responding to the fatal stroke of UN staff member Jesmel Navoa on March 5 in the Organization's basement printing plant, Thursday the UN Staff Union adopted a resolution relating Mr. Navoa's death to the management of the UN Department of Safety and Security. In a closed-door meeting Thursday afternoon, union Unit leaders decried that David Veness, the DSS chief who ostensibly resigned more than a year ago after the deadly bombing of the UN in Algiers, remains in place, adding to "uncertainty." 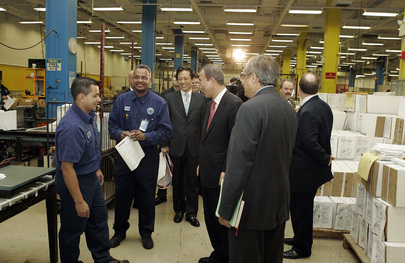 Secretary-General Ban Ki-moon was called to do more to ensure safety, including access by emergency services. Concerned rank and file security staff intend to meet with Ban's Deputy Asha Rose Migiro following Veness' refusal to implement a previous Staff Union resolution which called for an independent, external investigation of promotion and placement irregularities they said was documented by a leaked internal e-mail published by Inner City Press on February 6. Migiro will be asked to start the investigation. At Thursday's Staff Union meeting, the call was for an investigation of the circumstances of Mr. Navoa's death by the Office of Internal Oversight Services. Staff members linked the death of Mr. Navoa to one a year ago on the journalist's floor for of the UN, also reported on by Inner City Press, here. Ten days later, no information has been provided. Now questioning is expanding. When will answers be provided? Watch this site.